Dips and foggers are not recommended. There are better, less toxic alternatives to dips. If you have a large infestation in your home that requires a fogger, you will be better off calling in a reputable exterminator from a network such as Home Advisor. We recommend checking with your veterinarian for the best product for your dog. Click here for detailed information on dog flea treatment options." Allergies from canine fleas are caused when the flea bites your dog's skin. The reaction itself is due to sensitivity to the saliva in the flea's mouth. A typical flea allergic reaction will have your dog itching the moment they come in contact with the fleas. Itch from flea allergies could even continue after all the fleas have been killed. 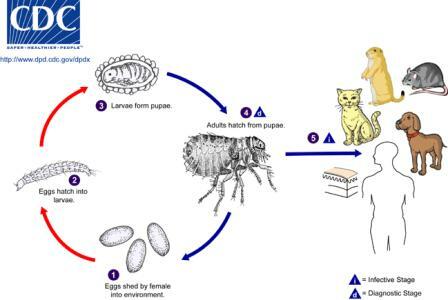 Canine fleas have a 4 stage life cycle, moving from egg to larvae, pupae and adult. Dog flea eggs hatch in 3 to 4 days and feed on environmental debris. Larvae form pupae in cocoons, that are covered with sand, rocks, pebbles and other items. After 3 to 4 weeks they hatch and seek a host such as a dog or even people. Common symptoms of canine fleas include itching, red pimples or bumps on your dogs behind (rump), under the legs, base of the tail, groin or belly. When your dog goes to itch this area, their hair can fall out and their skin becomes dry. If you draw an imaginary line around the center of your dog, and only see symptoms in the rear half, it is probably fleas. If the condition continues, the skin can become crusty and infected causing crusty lesions. The best way to check for canine fleas is to place your dog on a piece of white paper. Brush the coat and if you see white and black grains of what looks like sand. The droplets are actually lea eggs and feces. There is also a skin test that your Veterinarian can use to test for flea allergy and fleas. The goal of a dog flea treatment is to eliminate fleas from their body, hair and where they live. All pets that live with the dog should be checked as well. Your Veterinarian will treat fleas with creams and antibiotics to avoid infection. You can also use an antihistamine to help with the itching. Bathe Your Dog - Use a flea shampoo that contains a natural flea repellent. Natural ingredients such as Rosemary oil (Rosmarinus officinalis L.), Tea Tree Oil (Melaleuca alternifolia), Niaoli oil and Citronella oil all can help clean your dog and provide some level of natural protection. Bathing with a flea shampoo will kill fleas on the dog but not provide lasting protection. Grooming: Purchase a flea comb to pull the fleas from your dog's coat. Comb daily to ensure that any new fleas are immediately removed from your dog. Choose a Spot On: We recommended the Spot On Advantage since it has no toxicity to mammals. See our guide to dog flea medicines for information about other choices. Clean the Home: Eliminating fleas on your dog just removes only part of the flea problem. Flea eggs can fall from your dog and adult fleas can easily jump from your dog into your home. If you only treat your dog, he will quickly be re-infested with fleas. Consider using a plant based home flea spray. To remove the fleas from your home try and avoid clutter in the places where your dog lives, since fleas can easily hide. Be sure to vacuum the area at least 1x per week. There are some natural products such as Fossil Dust that can be used safely in the home to kill fleas that are in the home. There are several products that can help to prevent canine fleas. Popular and widely used, but not recommended. Collars can lose effectiveness when wet and tend to prevent fleas in areas closest to the collar. Oil based products that are applied to two spots on your dogs back. They last from 1 to 3 months and work by moving through the skin. They are safe and do not enter the body itself. They are considered to be safe and effective. Popular brands include Frontline Plus and Advantage. Prescribed by your Veterinarian. Although high in cost, they are very convenient with products requiring your dog to take 1 pill every month. Pills such as Sentinel also help prevent heartworm. Pills are not all the same. For example, Capstar kills fleas for only 24 hours and is given to dogs that have been exposed to a major infestation. This is then followed up with the use of a preventative such as Frontline Plus. Program is another tablet, that like topicals, is used every 30 days and prevents fleas for the entire time. It is also available as an injection which can last up to 6 months.